Everyone knows that the French are world champions of the watered down work week and the wondrous six week minimum paid vacation. But did anyone ever stop to ask where les français GO en vacances? Ask no more! They go to their résidence secondaire (second home) if they’re lucky enough to have one. It may be at the seashore, in the mountains, or deep in the countryside, it may be a castle, a studio apartment, or a trailer home, but whatever and wherever it is, the home away from home is a very French thing. With three million “second homes”, they have twelve times as many as the Germans, and more than anyone else in the world! I discovered the “second home” concept early on when Philippe, who was courting me assiduously, invited me to his parents’ country house an hour west of Paris, not far from the beautiful cathedral of Chartres. Although they had a lovely, spacious apartment near the Gare Montparnasse in Paris, the résidence secondaire, which his father bought during the War to get his wife and small children out of the capital, was a haven not just for the family but for the many friends who were invited to partake of the bounteous repasts served by my mother-in-law, a wonderful cook and one of the most hospitable persons I have ever met (I once heard someone accuse the French of being inhospitable – the person obviously hadn’t met her!). The Rochefort “second home” was built in the 1860s. With its low sloping tiled roof, from the outside it looks like an illustration of a fairytale cottage in a children’s book. Inside, the rooms are small but each has been lovingly painted and decorated and cared for. The house is only a few doors down from the village church, and only steps away from the mairie where my father-in-law served many terms on the City Council. Television rapidly changed social life in the village; my mother-in-law told me that when she was young, the main entertainment on a hot summer evening was sitting in front of your door and chatting with the villagers out for a stroll. Imagine that in this day of internet! My in-laws braved the Paris traffic every single week-end to arrive at the country place, air it out, go to the next village to buy groceries, come back and start some serious cooking and repairs around the house while assorted grandchildren and cousins and friends played in the huge yard and the more adventurous little ones crossed a wee bridge over a small brook that ran through the property (every once in a while a clumsy soul would end up in the water). Our youngest son spent most of his time sneezing and wheezing because of various allergies (to the country?!) but it didn’t make a dent in his pleasure. As for Philippe, he’d hit the couch, open a magazine, close his eyes and generally fall asleep. After a stressful week at the office (he’s one of those French persons who worked 80 hours a week, not 35) the country place was perfect for relaxation. While he napped, I would watch my mother-in-law’s doings in the kitchen and from her learned a precious thing or two about French cooking. No, not written recipes – they were in her head and she was incapable of transcribing them. My “lessons” were in the watching and the observing and the smelling and the tasting – all of which I did a lot. On cold winter nights after a long dinner we’d sit by the fireplace and perform a ritual: one of us would go to the cupboard to fetch thimble-size glasses into which my father-in-law would pour the Rochefort pear alcohol production. Yes, OUR pear production. Every year in the fall we’d all get in the tiny kitchen (total workspace: one counter) and cut up a thousand pounds of purchased Williams pears (for there were no fruit trees on the property) in four, then put the pieces one by one into two wooden barrels where they would remain until spring when the distiller would come along, all red-nosed because he’d been inhaling (or drinking) too much strong alcohol. With his copper still, he’d transform the pear juice into alcohol that would take every hair off the chest of even the hairiest man. But we love it and it’s good. Every time I uncork a bottle (by the way, a thousand pounds of pears only yields about thirty bottles), the smell of the wood in the fireplace and the country air and the happy faces of the friends and family in the room pop out and float in the air. Nostalgia’s one benefit and there’s another: our minimum-80-proof pear alcohol will kill any germ that comes near it. Extremely useful when you’ve got a cold. But buveur beware: don’t drink it like water which I rashly did one night with a friend. Result: I have never been so drunk in my life and my unsuspecting friend swore off alcohol for five entire years. I now sedately take a sugar cube and dip it into the glass (what the French call a canard, a duck) to get the pleasure of the taste but none of the side effects. So many memories: of my mother-in-law mending our clothes and caring for her geraniums and asking me at breakfast what we might eat for lunch (I’m under the radar in the morning and couldn’t engage with her on that one), of my father-in-law buttering slices of pain d’épices and bringing her breakfast in bed which she shared with the grandchildren who had piled into it with her, of all those meals that went on for hours with much laughing and talking (trust me, no one in that family ever said “Im not hungry” or raided the refrigerator – meals were at the table and twice a day like clockwork). I could write so much more about those magical days in the country place – and so could, I would imagine, any French person who has one. Why? Because those French “second” homes are often first in the heart. (The above entry is adapted from and based on excerpts from “Hanging Out Without Feeling Guilty” in my book, Joie de Vivre). All material copyrighted. This entry was posted in Uncategorized on June 29, 2013 by harriet.welty. OMG this brings me back to 1966 when I lived w/ a family on the Rue des Belles Feuilles for 3 months. They had a maison secondary in L’Isle d’Adam, Every Friday night after I got out of work (paid under the table in a book store), we left for the weekend. Only it was the husband, Jean Bossard, who cooked. In fact, on Saturday mornings at 10 AM he and his “potes” would have a full dinner of boeuf bourgignon which he cooked along w/ wine. They had been working since early morning in the “gardens” so a meal at 10 AM was normal! I biked to the center of town or to the pool. No TV. No air conditioning. Good thing I liked to read! Air conditioning (as well as tv) has changed modern life everywhere. People no longer sit on the front stoop to cool off in the evening so no occasion to talk to your neighbors who also were outside cooling off. And once TV was in every home (not to mention one-too -many channels), no one did much else. Internet is just another nail in the coffin. Reading this blog brought back those wonderful months of weekends in L’Isle d’Adam and like Proust’s madeleine, this post transported me back to those wonderful memories. Merci beaucoup! Ah, the French! They really know how to live. Thanks for sharing your experience! Recently I read your book French Toast and very much enjoyed it. It inspired me to make zucchini fritters from my French cookbook and enjoy a relaxed dinner..the French way. Thanks Tina for your kind comments as well as writing about French Toast on your blog. Great article! 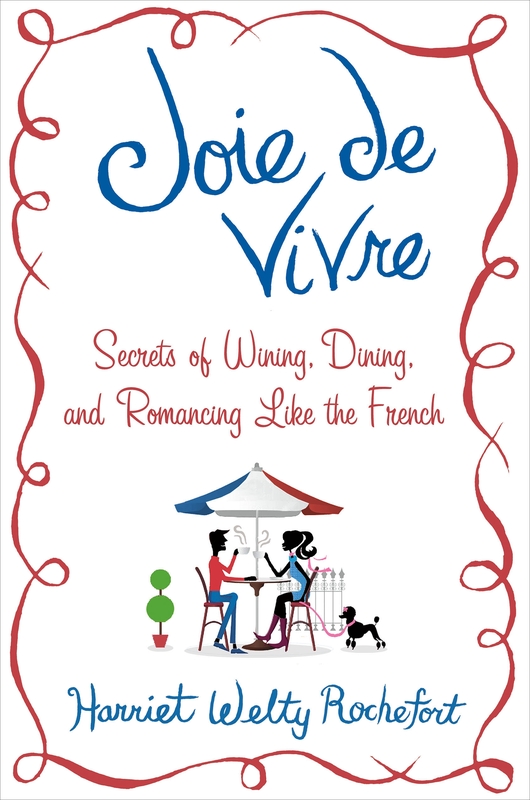 If you enjoyed French Toast, you’ll love Joie de Vivre which goes even farther in describing the unique way the French enjoy life. Hope you’ll get a chance to dig into it and find out about things like how the French hang out without feeling guilty (it’s an art form) and why French kids eat everything and learn to sit at the table for hours without acting up (maybe because the food’s so good). Hope you’ll enjoy it, and keep cooking!